The Military-Family: What a great idea! We recently received a great homemade gift from our son Dan and his wife Becky to commemorate all of those PCS and other associated moves while on active duty! 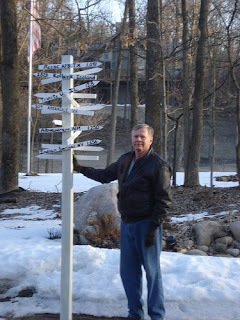 It was a sign post to place in the yard or on the street with all of our previous home locations spelled out with the distance in air miles to each from our current home! What fun it is to see the sign and realize all that it means. Each little sign indicates an American military family gathering its belongings, cleaning up a house, selling one on occasion or passing a base housing inspection on another! It also means saying goodbye to so many friends and co-workers and meeting new ones! It also meant new schools, new jobs and new experiences! From Panama to Iceland to Washington state to the Pentagon to Florida and Nevada with many stops in between! It meant more than a million miles in vehicles that we wore out. Many fond memories and some scary ones, too. Like the 15 year old with a learner's permit driving cross country with a parent who felt the need to close their eyes for a quick nap and discovering that the right way to turn off the cruise control was not to go faster! Fond memories of playing sports in a foreign country with their athletes; going to Ibiza, Spain with a chapel youth group and visiting Paris, France as a mom and son. The list goes on forever! We all shared the good times and the bad times but we found ways to support each other as well. No one really complained about the moves to avoid making me feel lousy for that next assignment so I could continue to grow as a pilot and leader. But I knew they were sometimes tired of them and looking for stability! So we found ways to experience the excitement of a new spot and become part of the community as quickly as possible! My wonderful wife and kids were so supportive as many of you are! We were typical but unique too! After retirement we decided we wanted to help military families as they create their own "signposts" of memories! Let us know about your favorite signpost locations and how you help each other during the stresses of military life!